Today was an awesome day. We're still having really nice weather with sunny clear skies, and we took full advantage of it. 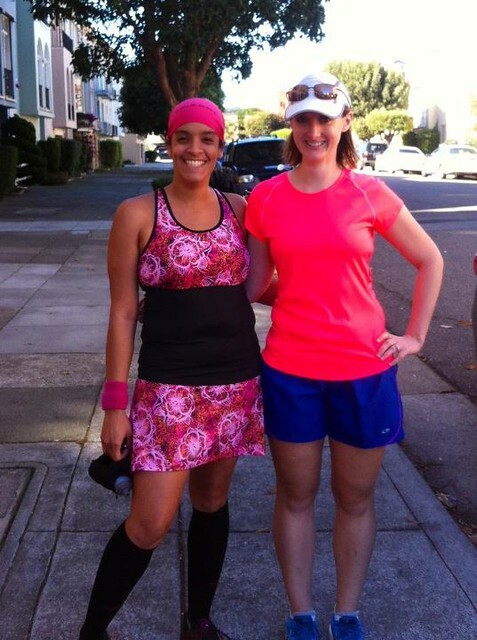 The initial plan was to head to Golden Gate Park in the morning to meet Katy to run together at the DSE 4 mile race. Due the US Half Marathon, the bus was rerouted and we never made it to the race, so Katy drove to me and we went for our own fun run in the Presidio. It was a lot of fun. After lunch we went on an awesome 8 mile hike with Thomas on the trails along the Pacific Ocean. It was breathtaking, but a little tough due to heat, elevation changes and terrain: dirt/rock/sand trails, up & down hills, up & down stairs, sand, and sand ladders. The amazing views were well well worth the pain. We walked from Marina to GG Bridge, down Coastal and Battery to Bluffs trails (with lots of up and down stairs), down the Sand Ladder to Baker's Beach, across the beach to Land's End, through Sutro Heights and finally ending at the Beach Chalet Restaurant in Golden Gate Park. After a yummy dinner, we took the bus home and unwind with a Disney movie, Aladdin! I'm more sore from this than the marathon, but it's different muscles and I had a blast. I took a ton of photos along the way with my iPhone. View the slideshow below, or browse them yourself on the Flickr.